msbiro.net: Watson Workspace announced ! Cognitive era has joined social biz ! Watson Workspace announced ! Cognitive era has joined social biz ! Starting from 24th October to 27th October there is IBM World of Watson in Las Vegas and IBM is is making some great announcements like Bluemix and Softlayer as unified Cloud platform and announcement inside the Watson at work family like IBM Watson Work Services and IBM Watson Workspace. Watson Workspace will be the first "ICS sotware" released using the Watson services API to provide cognitive capabilities inside collaboration software. 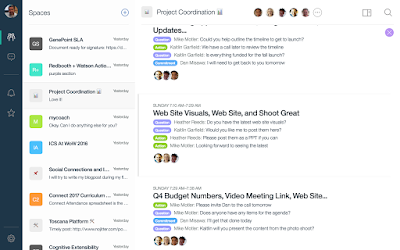 As you can see in the sreenshot below taken from Luis Benitez blog, Workspace is a collaboration software where users can organize team spaces to discuss about projects. Using Watson services API IBM has integrated the first cognitive feature named Moments that enable users to have summaries of conversations in seconds. For instance moments could be useful during busy working days or holidays to undestand instantly what you have miss! Moments is the first cognitive feature available but others are planned to comes during near futures. To have more informations about IBM Watson Workspaces, and cognitive features please see the video below with the IBM Wow sessions from Inhi Suh with Luis Benitez demo. 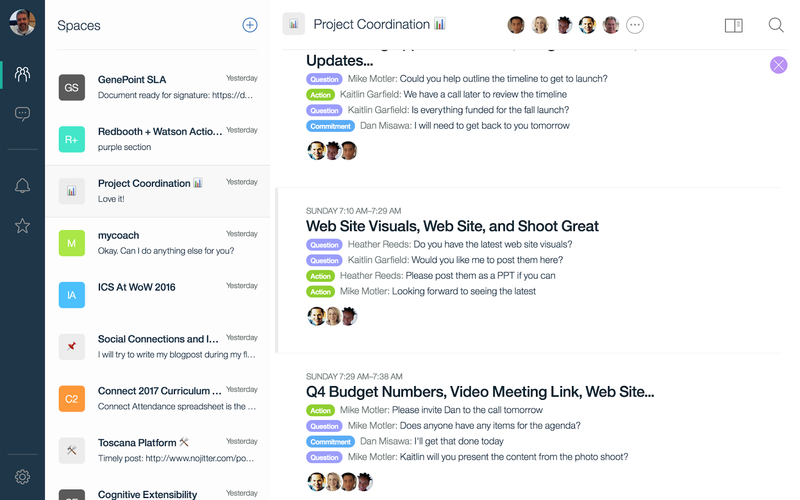 We are at the start of an era, Workspace was just announced and is currently in preview version in limited availability mode, but looks great (I'm one of the lucky people inside the preview ) and the announcement of the availability of Watson services that are producing announcements like the IBM and Slack partnership allows me to say IBM is going in the right directions !